7.11.12: Well, yet again I have to apologize for the delay in updating. Since the last post, the gx200 reduction drive Eggmotor has had it’s first successful test flight. There have been some issues with the exhaust bracket failing but I’m hoping that is now sorted. Also, I have swapped the 1 litre gravity feed test tank to a pulse pump feed 5 litre tank. Here is the footage taken from the first test flight back in late July 2012. Location is a Cloud Hoppers Club site near High Marnham, Nottinghamshire, England. I’ve roughly estimated climb rate to around 200fpm. Pilot weight of approx. 100kg with a ’27’ Windtech Kinetic non-reflex glider. 8.05.12: Hello again, well unfortunately the latest Egg has yet to fly the nest due primarily to the poor weather so far this year. I also have an intermittent back problem which always seems to flare up when the weather does improve. 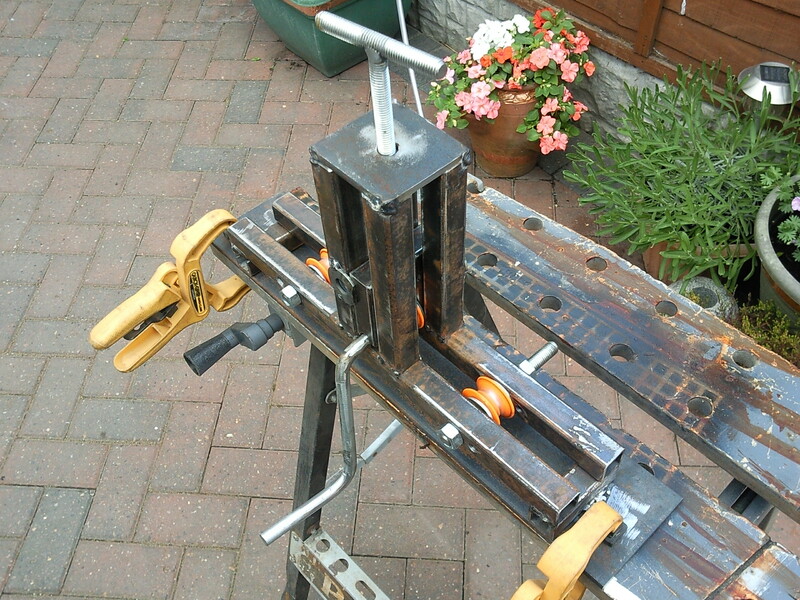 Since the initial testing back in the Autumn of 2011, I have made some minor tweaks and modifications. I’ve switched the spark plug to one of those fancy Pulstar Pulse-Plugs, it has a capacitor circuit which apparently creates a much larger, quicker and hotter spark. The manufacturer claims upto 12% more power and torque so I’m now expecting to easily hit the 50kg thrust mark on any future bathroom scales tests as the November 2011 test was just off the mark (48-49kg). I have also fitted a rubber mounted support bracket to the exhaust as concerns were raised by one or two forum members regarding vibration and premature failure. Hello All, I would greatly appreciate it if you could subscribed to our YouTube Channel please. 6.11.11: It’s has been a while since I last updated the blog and there is much to mention. 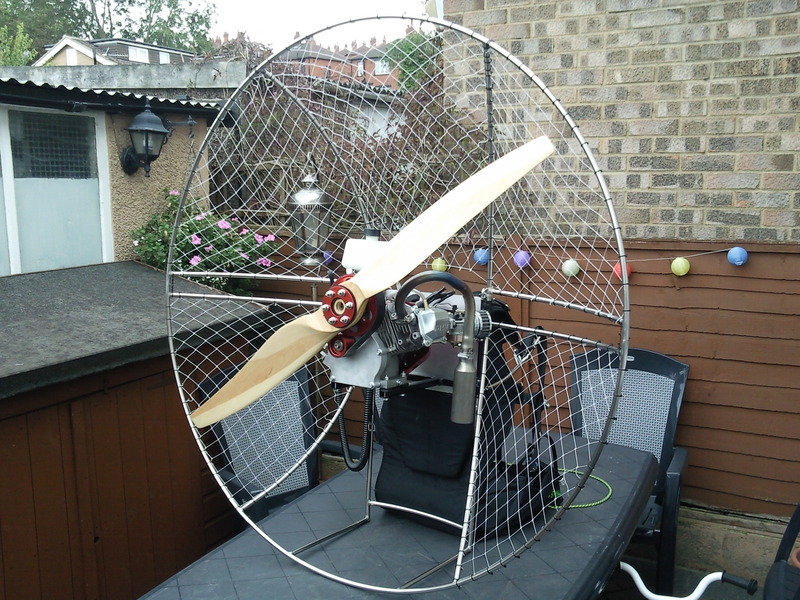 The original Loncin gx200 engine now has a new home in a larger stainless steel frame together with a Bailey-Egg reduction kit and a 1.3m prop from D&T Propellers. This machine was originally built for a BIG challenge but due to financial constraints the ‘challenge’ has been abandoned for the foreseeable future. I did initially try a smaller alloy framed design to utilize the redundant fan blade assembly from the defunct Eggmonster project but I was unhappy with the strength and quality of my ‘Durafix’ joints. 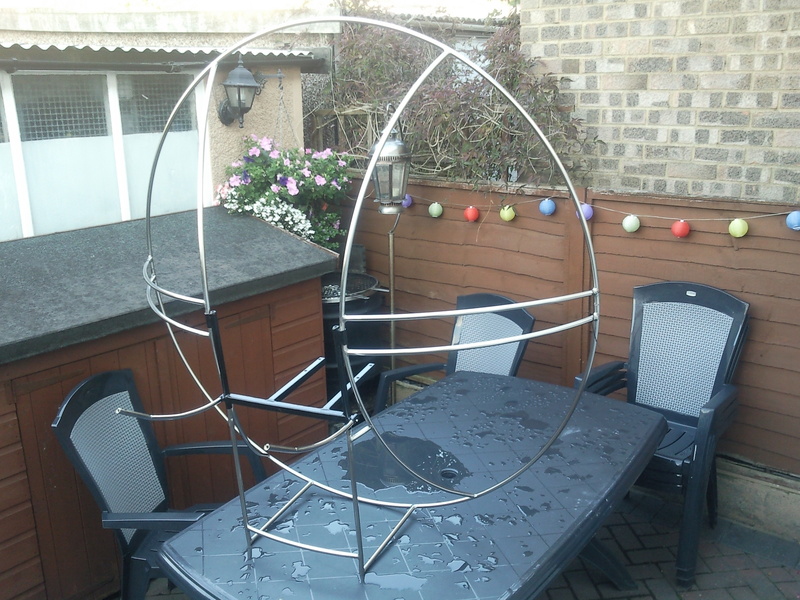 So I invested in some 16mm stainless steel and made a tube bender to roll the cage sections. Now we have the same thrust of the old Eggmonster but for much less weight. With our bathroom scales we achieved 48-50kg (106-110lb) thrust this afternoon. 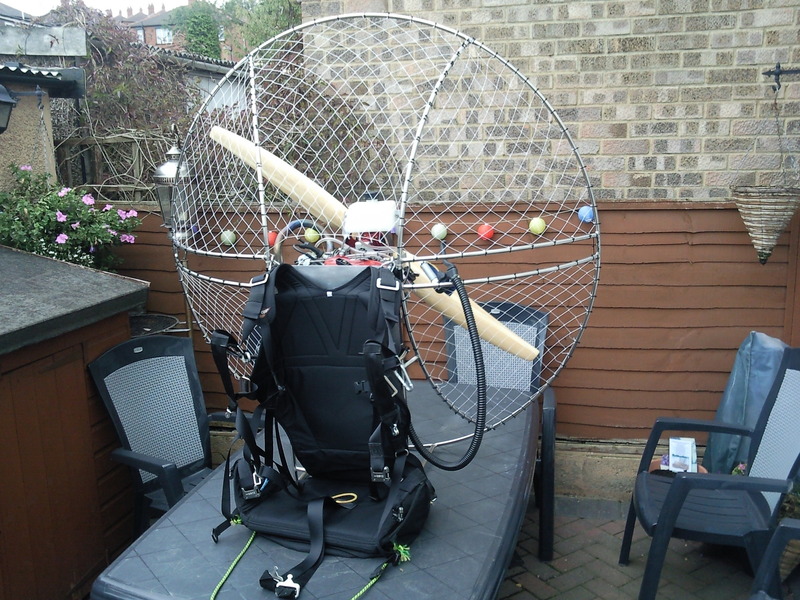 A few minor niggles to sort out and we will be ready for our maiden test flight. 07.07.11: Hello folks, a lot of changes happening in the ‘Egg’ camp at the moment. I can’t give too much away at the moment but the little Eggmotor has been stripped down. 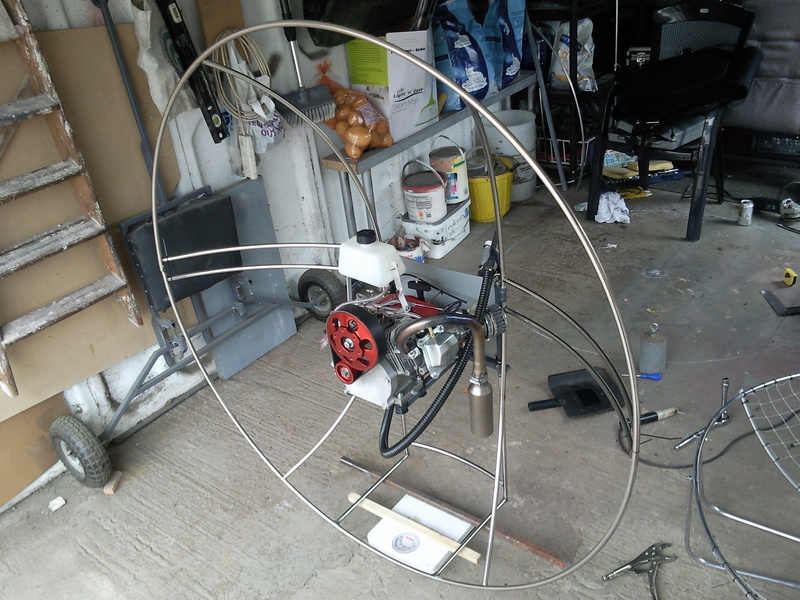 The 36×10 Xoar prop and hub have been sold already and the black chassis/cage might have a new home very soon too. 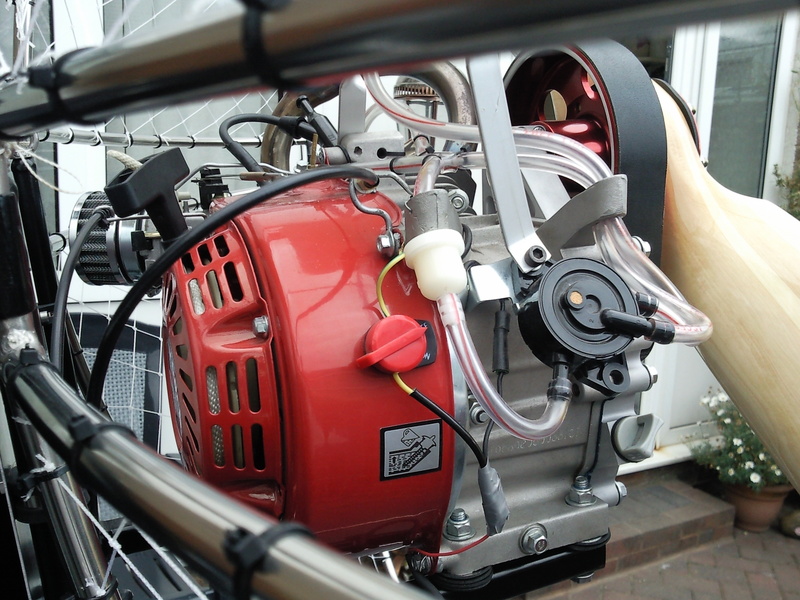 Many factors have contributed to recent developments, mainly my inability to loose weight to make the direct drive option a viable means of propulsion but also a new project which requires the original Loncin gx200 engine as I’m too skint to afford a second tuned engine. An all new reduction drive unit and brand new cage design are currently in the development and construct stages…….. more to follow. 08.06.11: Back in April I headed down to a field in High Marnham. This site is used by the CloudHoppers Club and I was also there with an unsuccessful test the previous September. This 2nd test flight, despite the bigger carb and higher compression head seemed to be a carbon-copy of the first test at this site. After take off I seemed to stop climbing and so again made the decision to abort. I really need to get back down to 14st (90kg) to stand any chance of decent performance, I’m currently around 15.5st(97kg). I probably would benefit from a larger wing too. My Kinetic is a ’27’ but I could do with a ’29’ size at least really. 30.03.11: Sam and I conducted another bathroom scales test at the weekend and amazingly and also annoyingly only achieved around 35kg thrust??? I’m not sure how accurate this method is but the carb jetting is much better/richer now than the last recent scales test when we got around 38-40kg thrust (see previous video). I can only speculate that is type of testing is quite flawed……… Well that’s what I’m hoping any way. Unfortunately, when I checked the data, the 4900rpm I achieved in the garage a week or two ago doesn’t equate to the 45kg thrust I was expecting with my own calculations. It is more like a meagre 42kg thrust instead. I need to achieve 14.5hp/5000rpm in order to get the 45kg (44.7kg according to data) performance I’m wanting, the 4900rpm we got only equates to 13.5hp. I’ve ordered a Pulstar pulse plug to try and achieve improved combustion and may be squeeze an extra fraction of thrust.